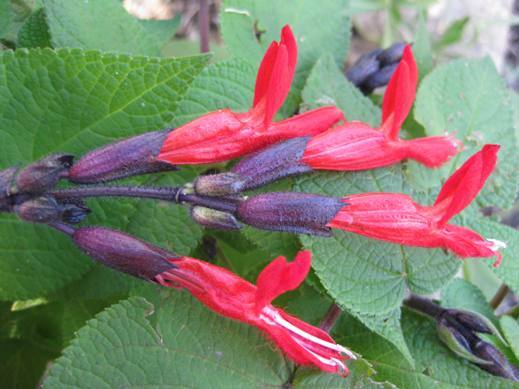 There are over 700 species within the genus Salvia. Salvia officinalis is common sage that we love so much with chicken and salvia splendens is that red Bunnings annual salvia that self seeds so well you only ever have to buy it once. The perennial salvias which come every colour possible and grow so well in Coffs have an added benefit - they attract some interesting bees. Bring along your favourite for the competition table on Saturday. Comprising about 900 species of annuals, perennials and soft-wooded evergreen shrubs, this genus is the largest in the mint family. They can be found naturally in temperate and sub-tropical regions throughout the world (with the exception of Australasia) and grow in a wide range of habitats, from coastal to alpine. A number of Salvia species are used for culinary (see left S.elegans which is usually grown for its pineapple-scented leaves) and medicinal purposes and the genus name is derived from the Latin salvare, meaning to heal or save. Although it might be best to stay away from S.divinorumwhich is a psychoactive plant which can induce visions and other altered and spiritual experiences! Most species are hairy to some degree and have foliage that is aromatic when crushed or rubbed. The flowers are tubular with the petals split into 2 lips, which may be straight or flaring. The flowers vary greatly in size, and the colour range is amazing as it moves through shades of blue to purple, and pink to red, as well as white and some yellows. Most Salvia are best grown in full sun and they require a well-drained position. Generally, the shrubby plants dislike heavy wet soils however they seem to cope with Coffs Coast conditions. Propagation is dead easy from soft-wood cuttings taken throughout the growing season. 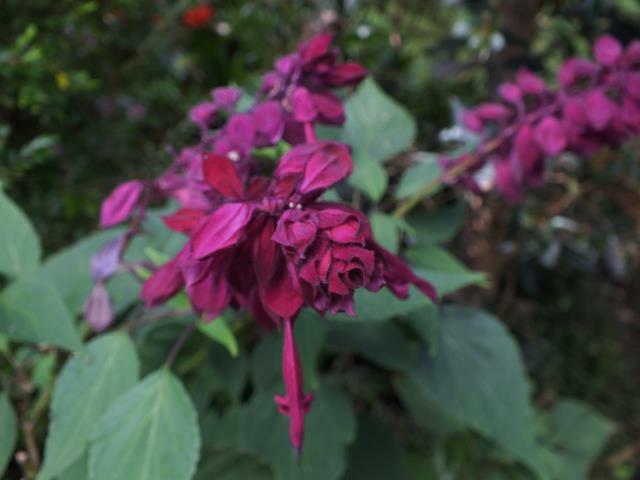 Since this post was written the January 2016 issue of Gardening Australia has been published and there is a beaut article titled 'Celebration of Salvias'. I couldn't obtain a link for this article but have a linked an ABC factsheet on growing Salvias here.